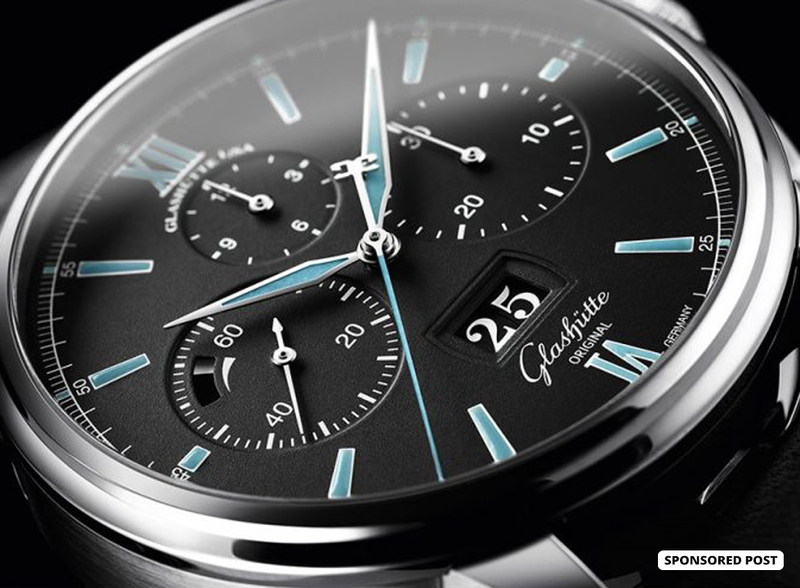 German functionality at its finest, Glashütte Original marries traditional design with contemporary fine watchmaking to create some incredible chronograph timepieces which would thrill any lucky watch collector this Christmas. 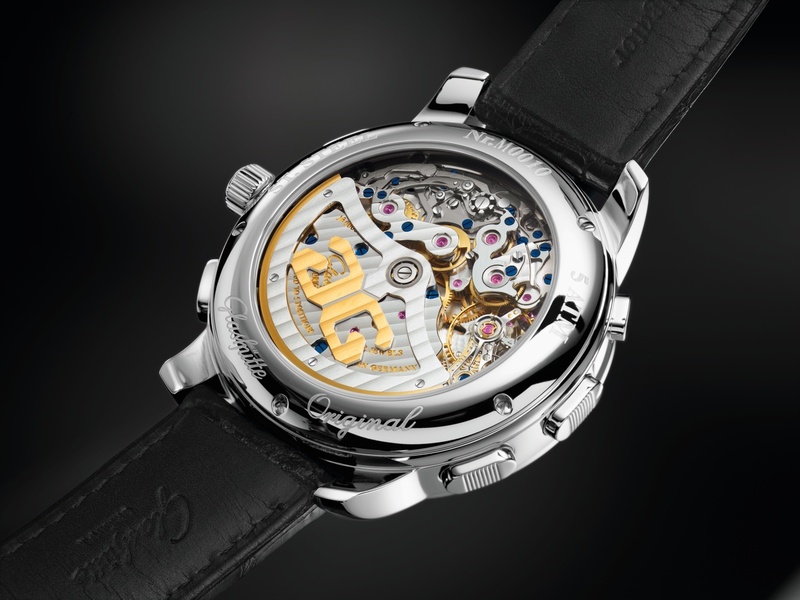 The automatic, ultra-modern PanoMaticCounter XL calibre 96-01 is a remarkable complication, whose counter function is comprised of over 200 components. Overall there are nearly 600 individual components inside. Each element has not only been crafted with extreme precision but has also been decoratively finished in the Glashütte way at their Saxony manufactory. 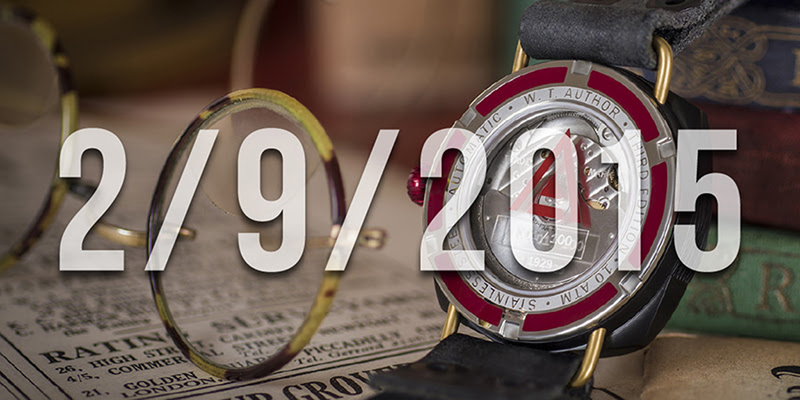 As with the Panorama Date at 3 o’clock, the counter window displays double-digit numbers, as can be seen on the opposite side at 9 o’clock. Further functions of the PanoMaticCounter XL include a chronograph with stop-second, 30 minutes display on the right, counter function forward and backward (00-99), small seconds on the left and hour and minute at 6 o’clock. The dial is encased in stainless steel, measuring 44mm across the wrist. A versatile watch with an aesthetically sporty feel yet refined as a dress watch. On the outer case, the pusher at 9 o’clock counts up to 99 whilst the 10 o’clock pusher resets it back to zero. Alternatively, the pusher at 8 o’clock will count back one digit at a time. 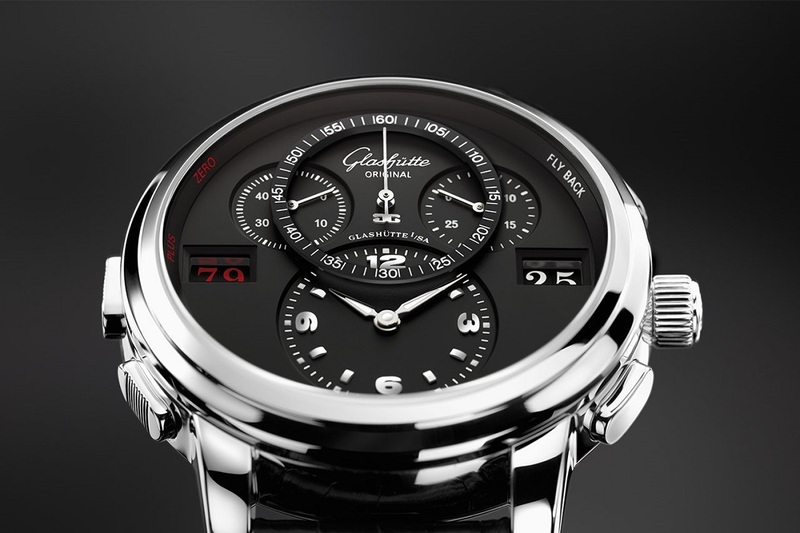 The PanoMaticCounter XL provides approximately 42 hours power reserve. Click here for an animated video to see this movement in action. The PanoGraph is the contemporary heir to the original PanoRetroGraph which launched in 2000. A stand-out timepiece with its asymmetrical dial, it has been rejuvenated in a distinctly modern manner. The PanoGraph has a larger case, measuring 40mm in diameter. On the dial, the hour/minute and subsidiary seconds dials are interlocked and positioned on the left, whereas the large Glashütte Panorama date display sits neatly at its usual 4 o’clock position. The chronograph’s 30-minute totalizer represents the original design in a contemporary look with a supremely elegant set of three cumulative ten-minute scales with three separate pointers. The two chronograph pushers at 4 and 2 o’clock are labeled in black, “START-STOP” to time and “FLY-BACK” to reset. The case is red gold as are the hour indexes and hands (including stop/seconds hand on the main dial and subsidiary seconds hand). Like all Pano dials, proportionality is key to ensure the timepiece functions harmoniously. The beating heart of this mechanical wonder is the Calibre 61-03, designed and hand-crafted in the Glashütte Original manufactory. The manually wound column wheel chronograph is outfitted with a classic switching wheel that operates the various chronograph functions, including start, stop, reset and the flyback mechanism. 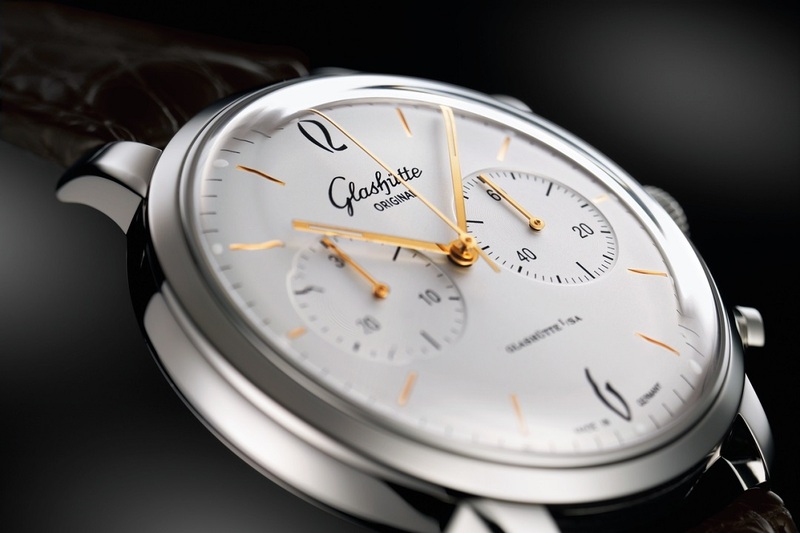 With a sapphire crystal case back, the characteristic features and finishings of Glashütte Original movements are clearly visible, including the traditional three-quarter plate with Glashütte ribbing, screw-mounted gold chatons, screw balance, and swan-neck fine adjustment. The PanoGraph comes on a black Louisiana alligator or brown nubuck alligator leather strap. 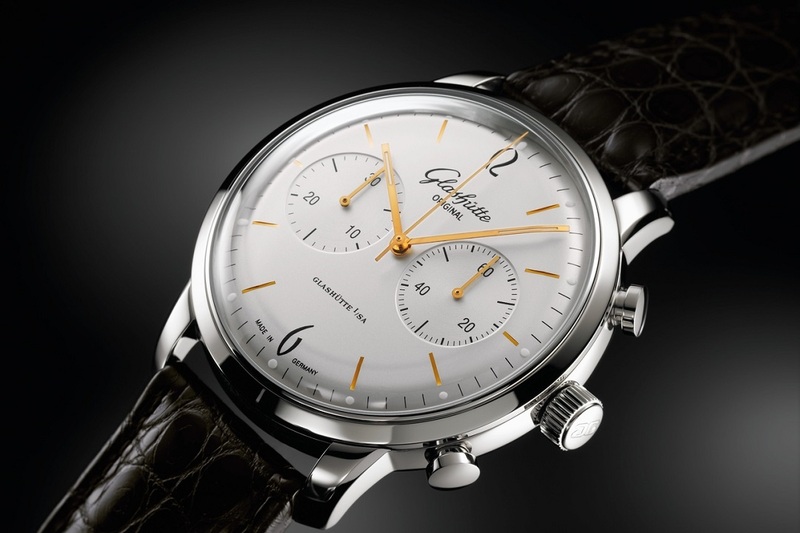 The ever-elegant Senator Chronograph Panorama Date is powered by Glashütte Original’s in-house 37-01 calibre movement. Measuring 42mm, the Senator features a polished and satin-brushed platinum case with three dial variations (hand-finished dial by friction, varnished matte white dial and varnished black dial with hands and hour indices inlaid with Super-LumiNova), as well as a red gold case option with a varnished silver-grainé dial. The design philosophy is simple yet compact. The manufactory’s in-house design team cleverly integrated a unique combination of features which work in harmony together. On the dial, a 30-minute counter is positioned at 3 o’clock and a 12 hour counter at 12. 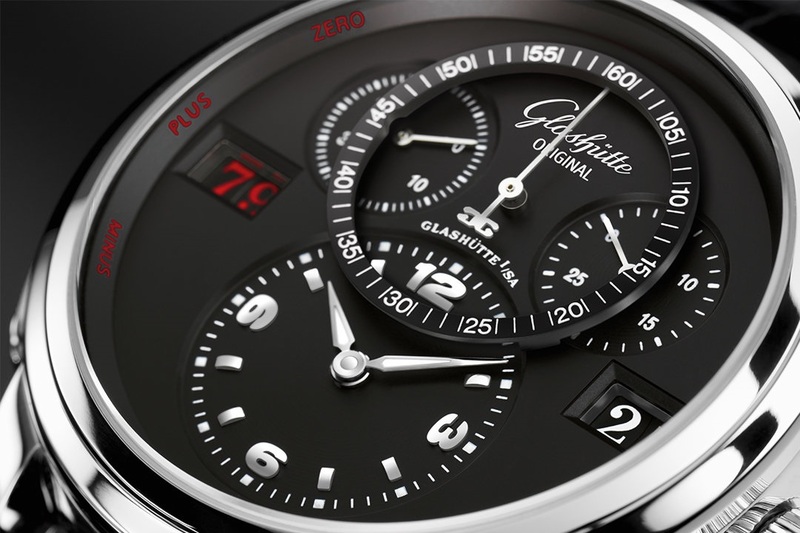 The small seconds’ dial is situated at 9 o’clock and the Panorama date window sits neatly below at 6 o’clock. The start and stop functions are activated by the top pusher and on the lower end lies the button for the flyback mechanism. 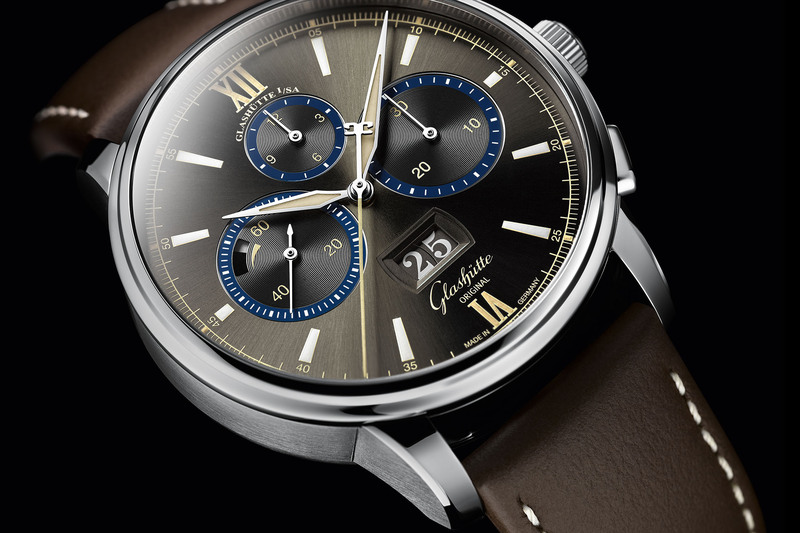 The Senator Chronograph also includes a power reserve indicator with 70 hours power reserve. The movement contains 65 jewels, a skeletonized rotor and is beautifully finished with polished steel parts and blue screws. 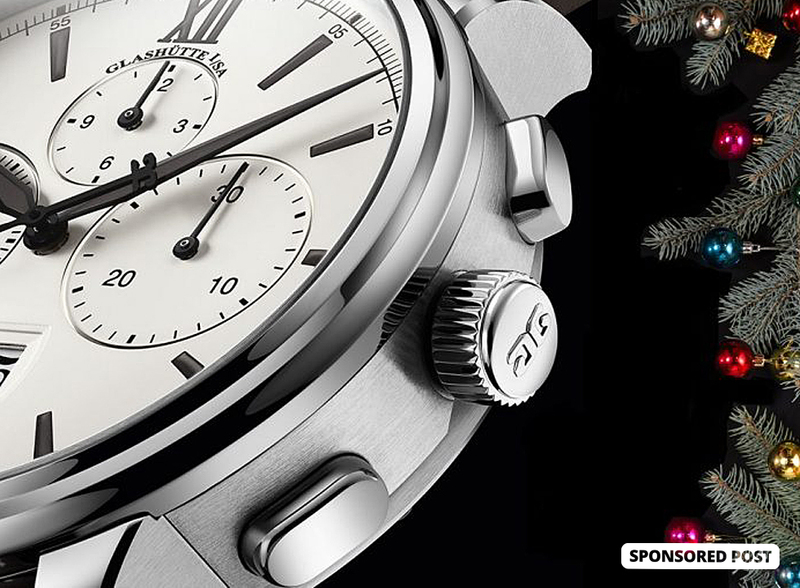 Click here for an animation of the Senator Chronograph Panorama Date in action. 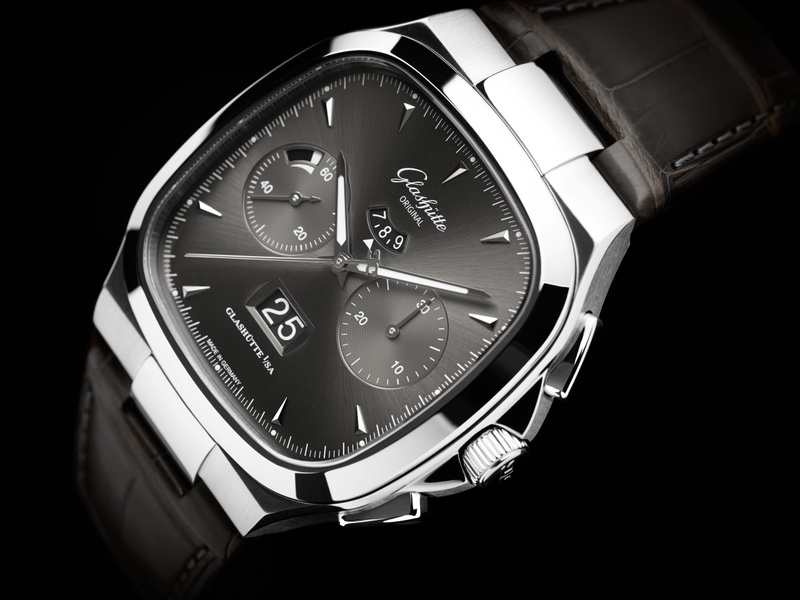 The Seventies Chronograph Panorama Date features an integrated chronograph movement designed and built in the German watchmaker’s manufactory in Glashütte. Three versions are available with dials in galvanized ruthenium, galvanized silver or blue. All three timepieces feature the Seventies collection’s soft-cornered square stainless-steel case and bezel and are either teamed with a stainless steel bracelet, leather or rubber strap. 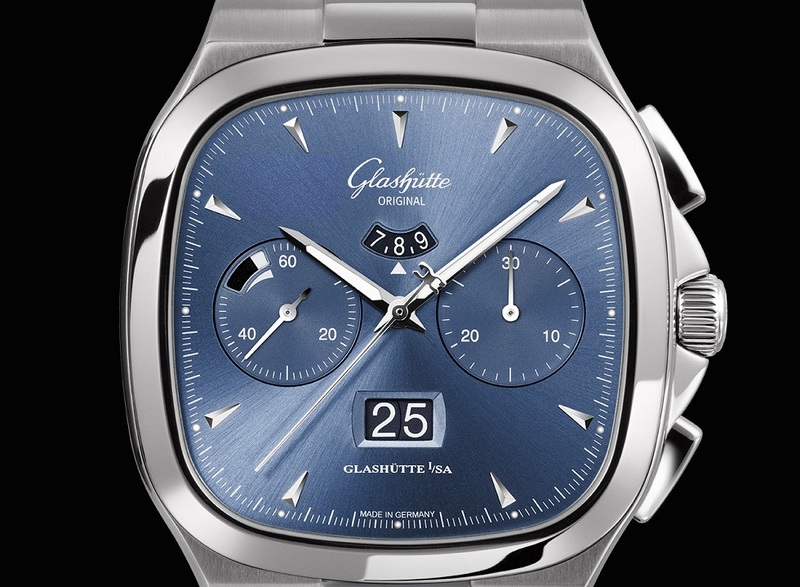 Glashütte Original created the Seventies Panorama Date with the 1970s era in mind, a time of exciting new shapes and developments in design, as is evident in the case and dial design. The 40x40mm stainless steel case curves capture the spirit of the 70s, characterized in the stream-lined and soft-edged facets. On the dial, the hour indexes are in white gold and the hour and minute hands also in white gold are partially inlaid with Super-LumiNova for improved legibility. The watch functions include central stop seconds hand, 30-minute counter at 3 o’clock and a sophisticated arched counter at 12 o’clock highlights the hours in Roman Numerals 1 through to 12. A power reserve indicator of 70 hours sits at 9 o’clock, with Glashütte Original’s Panorama Date display in the lower half. 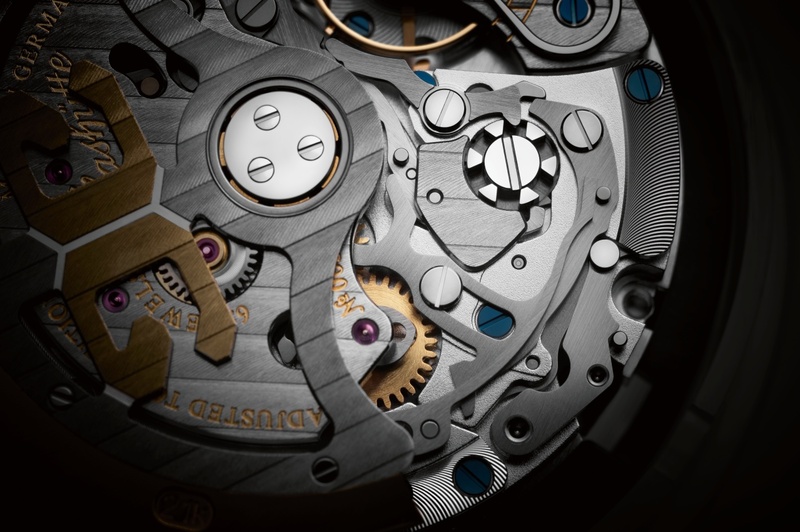 The automatic 37-02 movement is without a regulator on the spring which in-turn allows the movement to run continuously over a much longer period of time, meaning increased precision. 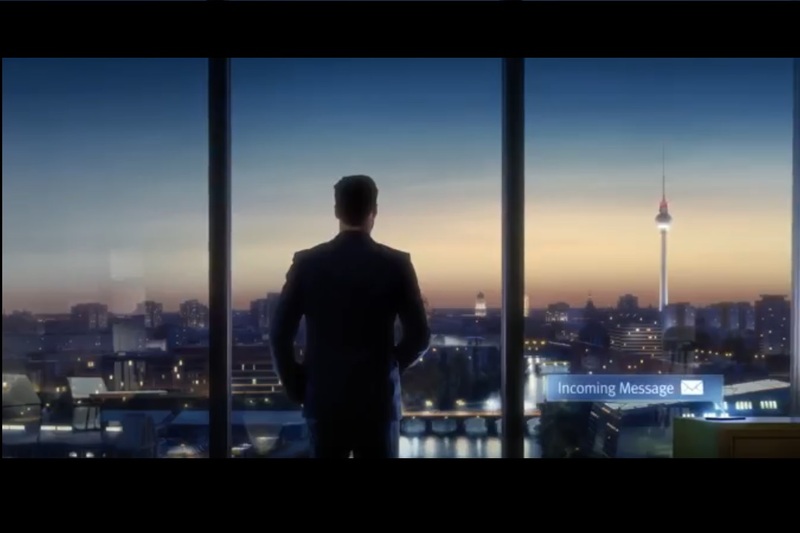 The components are visible through the sapphire crystal case-back. 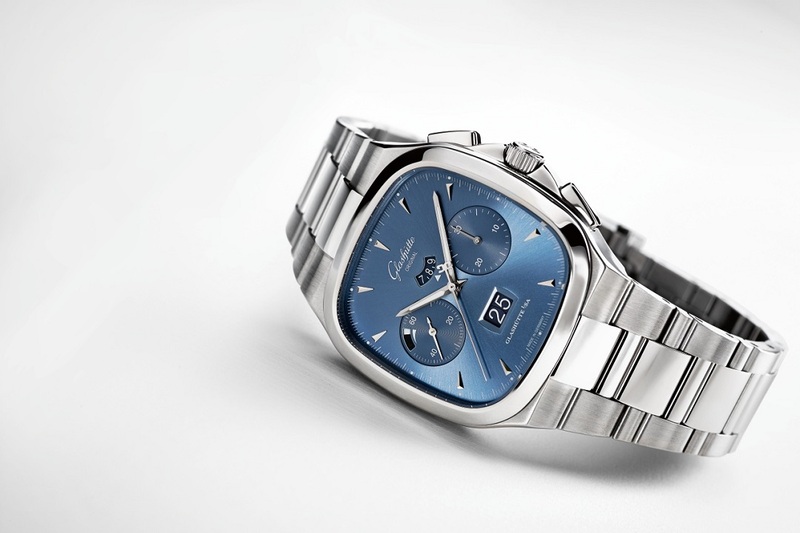 The exciting era of the “wild 60s” inspired the design behind the strikingly stylish Sixties Chronograph. 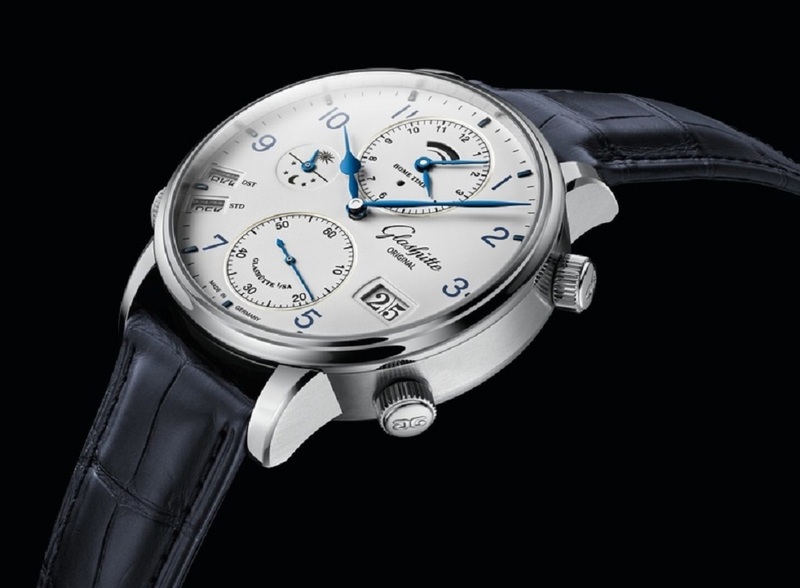 The domed dial and sapphire crystal give the case a cushion shape. The hands are also domed and skeletonized featuring Super-LumiNova. In a similar fashion, the diamond-cut hour markers are dotted with Super-LumiNova, with hours 12 and 6 represented in an extravagant font, paying homage to the style of the 60s. Chronograph counters are positioned at 3 and 9 o’clock with the pusher buttons situated on the outer case. This elegant timepiece of stainless steel features a sapphire crystal on the back of the case, which falls in-line with watch design at the time, allowing for perfect viewing of the automatic manufacture calibre 39-52. 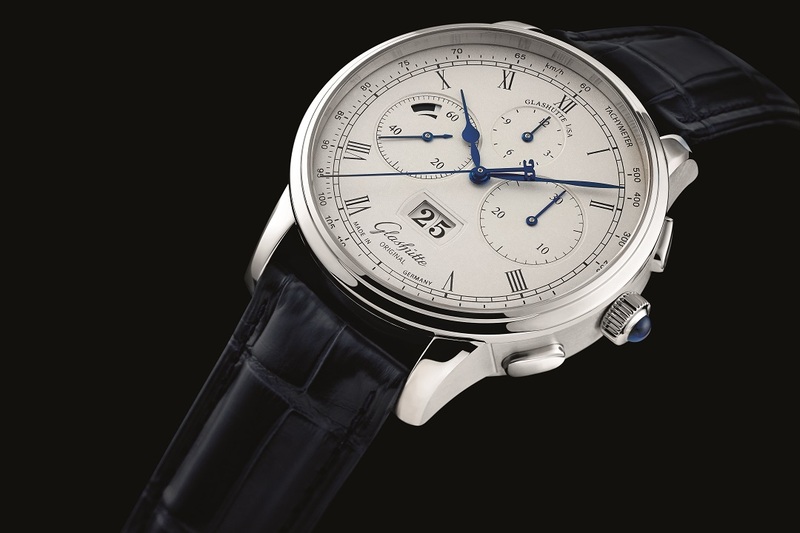 Therein lies characteristic elements of Glashütte watchmaking such as a three-quarter plate, swan-neck fine adjustment, Glashütte ribbing, and double sunburst decoration. The retro-modern look of the Sixties Chronograph is continued in its finely worked alligator strap and is available with either a galvanized silver or black fine matte dial.